With preparations for ULTRA’s continued conquest of Asia well underway, ULTRA Worldwide has released the first selection of artists for its’ 7th annual event in Seoul, Korea. The first round of artists are sure to grab the attention of electronic music fans across the board, showcasing an already stacked lineup of Main Stage and global talent. 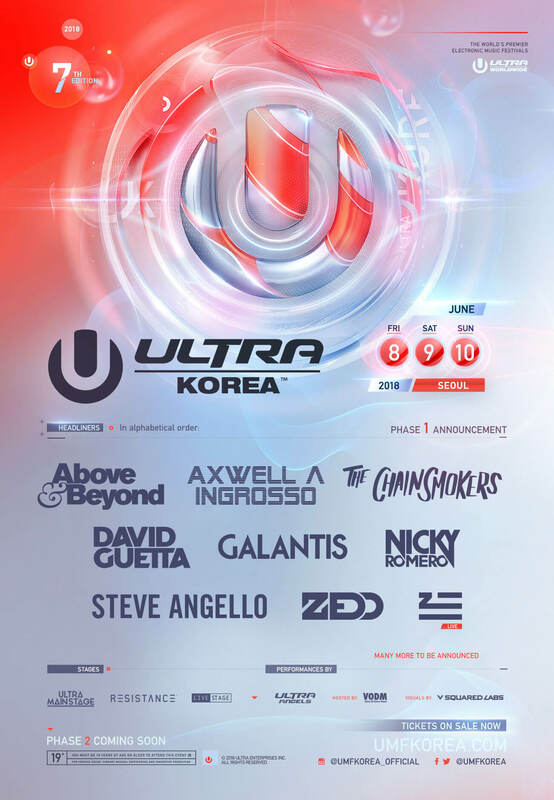 Historic progressive house mainstays Above & Beyond, Axwell Λ Ingrosso, David Guetta, Nicky Romero and Steve Angello will take to the decks of ULTRA Korea this June, guaranteeing a weekend of high energy dance music. Uplifting melodies and beloved festival anthems will be highlighted throughout the weekend by all-stars Zedd and The Chainsmokers, with the latter having closed out ULTRA Miami’s Main Stage on Saturday, March 24th with a riveting live performance, and last but not least Zhu will be performing live for his Ultra Korea debut. Following 6 years of continued growth and overwhelming success, the event will be expanding upon 2017’s two-day festival. ULTRA Korea 2018 will take place over the course of three days, June 8th, 9th and 10th – 2018 in its home city of Seoul. In 2017 ULTRA Worldwide made its mark on the Asian market, hosting 17 events in 10 countries across the vast continent, and drawing over 400,000 fans across all events. After a record first year sell out in Shanghai in 2017, 2018 is forecasted to be even larger with new events planned, including a brand new fully-fledged ULTRA festival in Beijing, and the renewed extension of the Korean festival. ULTRA Korea will take place on June 8th, 9th & 10th in Seoul, Korea. Tickets are on sale now, and selling quickly, with all early bird passes already sold out. Visit umfkorea.com/tickets to secure your experience while you can.